How I went from a struggling cornet player in a small town in Australia to helping 1000’s of wind players worldwide develop skills way beyond their dreams. Before there was an internationally top selling trumpet/brass method book. Before the world’s first interactive eBook M2MII. Before there were the 5,000+ sales and 1,000’s of subscribers, there was a frustrated and curious teenage brass band cornet player. Desperate for knowledge. Eager to help. I didn’t have a smooth ride to a professional career. Anything but, in fact! While I practised hard and won the best junior award in my first year at the Wodonga Citizens (brass) Band, I had no idea of the terrible habits I was developing. I started playing the cornet when I was 13. Where I come from, these days we’d say I was in middle school. I dreamed of playing like the best of ‘em. Luckily for me, late one night I heard on the radio for the first time, Maynard Ferguson playing “Fireshaker” directly followed by Lee Morgan playing “Sidewinder”; it was music I had never heard before but instantly loved. In fact, a few years later, I said to myself, I’m going to play like James Morrison. (He was not just one of the greats during my adolescence, but practically a local legend!) And just like one of those pacts you have, I was determined to play a High F and never miss it again. And that’s where the tale just falls apart. I just couldn’t do it. Try as I might, as hard as I could, as long as I did…absolutely nothing worked. I was crest-fallen. Looking back, I can see that I did everything wrong. My muscles were pinching. I was all clammed up. I was practically choking. It was all hard. Just plain ol’ Hard Work. Like weightlifting. Things didn’t get better for years. I did keep playing (!) and I did go to university to continue learning the trumpet because my dreams were still strong, but they were tainted. I bought into all those myths. You know, the ones about being “strong”, “blowing hard”. I was listening to my teachers and practising umpteen trumpet methods. But something was wrong. Fast forward to the end of university and I swear something had to change or I was just going to have to give it up. I was desperate. I couldn’t keep going, repeating the same thing and expecting to magically find the key, the secret. Besides, if I was going to have to work any harder to get another octave, I was seriously going to burst blood vessels. As it was I was already getting headaches and the occasional migraine. That got me thinking. And instead of picking up the trumpet, I picked up Physics books. I knew the key must be in there somewhere. Something about sound production, pressure waves, resonance. I just had to get to the bottom of the roles that the lips play and how the body is involved. Was it just as I thought? What was I missing? I read about other players with great reputations…teachers in their own rights. People like Rafael Méndez, Maurice André, Jean-Baptiste Arban and other people you have probably heard of. And that work, that 5 years of research kicked me off on my journey to deliver what is arguably the best system to learn and play trumpet easily and achieve superior results. I’ve gone through the process. I’ve done the hard yards, so YOU can benefit. In fact, my epiphany, the moment the “penny dropped” for me was when I was almost 30 years old. I was sitting there playing (actually I was playing the trombone) when I felt “it”. Although what I was reading was contrary to my beliefs, I was prepared to sit there for month if I had to, just to make “it” happen. It made sense logically. And then “it” did finally happen when I surrendered to the process (that I will share with you). And I felt goosebumps all over me. It was amazing. I knew right then, that I had to write a book about it. My work developing Mystery to Mastery (my initial books) and the new and improved WindWorks online learning system is the result. I show you step-by-step how to recreate the process in your own body, mouth, lungs, instrument (whatever you play). And most importantly I will share with you the Singing C Series which is a complete game changer. Anyway, that’s my story, (the really quick version). I went through years of trial and error and out the other end of that, I made it my mission to help as many other players as I can. I always loved sharing new discoveries, even back in the brass band days and through university to this day. I continue to develop and refine my approach and I know that the WindWorks course, the only course of its type in the world, will simply blow your mind. Oh yes, I almost forgot to include my bona fides: I’m a Yamaha Artist and have been for more than 10 years. I was Lead Trumpet for 15 seasons on Dancing with the Stars and have played with every major orchestra in every state in Australia. I have played at Carnegie Hall and have played with Herbie Hancock, Seal, Jerry Lewis, Burt Bacharach, Michael Buble, The Temptations and Shirley Bassey just to name a few. I have played over 30 professional musical theatre shows. Oh and almost to the day, 20 years after seeing him for the first time, I toured with James Morrison and believe it or not, our first gig was in my home town where I first saw him… simply an amazing experience! But, I believe my greatest gig is teaching wonderful students of all ages from all over the world. I am honoured and happy to have many students (thousands in fact, and some of whom are teachers) who also have been driven by their quest to make their playing EASY and enjoyable and better than ever. Perhaps I can help you too! WHAT IS MTM? Mystery to Mastery (MTM) is the most modern, easy to use and logical approach to trumpet playing available. MTM offers you Step-By-Step troubleshooting advice. MTM is for people who love the trumpet and want it to be easy. A ground breaking and top selling method by Dancing with the Stars (OZ) lead trumpeter, Greg Spence. Mystery to Mastery exists to explain why most people fail to reach their potential. Whether you want to play as a hobby or as a professional, MTM is here to help beginners to get off to the best start, and to help players of all standards troubleshoot limitations. “The Mystery to Mastery Method taught me how to go beyond the playing plateau that most players hit. Understanding how the body and the instrument work answered many questions other regular methods could not. The Step-By-Step layout and gradual approach allows players of all styles and standards to recognise and overcome technical flaws. An absolute must for all brass players!”. 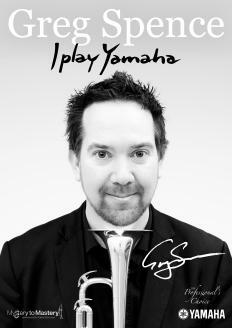 YAMAHA ARTIST and Dancing With The Stars/Strictly Come Dancing (Australia) trumpeter GREG SPENCE.Greg is a renowned clinician and freelance studio trumpeter. His impressive industry experience in performance and education places him at the forefront of modern trumpet teaching. Whether you are a complete beginner, advanced player or teacher looking to advance your skills, Greg’s insightful lessons, endorsed by world class players, will inspire and extend you in all aspects of trumpet playing and teaching. There are innate traps that only the lucky few avoid when beginning their trumpet playing. Overblowing and lip pinching are the primary problems I see in 99% of my students. It is very easy to recognise these issues having done them myself for so many years. Over the last 25 years, I have researched many methods and approaches for improving on the trumpet. Being self-taught originally, I have fallen into most of the many traps that the trumpet can present you with. I am inspired by my idols Maynard Ferguson, Raphael Mendez, Bobby Shew, Doc Severensen, James Morrison, Bill Chase, Lee Morgan, Maurice Andre and the likes. I have dedicated my life to this wonderful instrument and in doing so have learnt amazing information from world renowned teachers such as James Stamp, Claude Gordon, Carmine Caruso, Dr Charles Colin, Max Schlossberg, Jerome Callet, Bill Adam, Arnold Jacobs and Jean Baptiste Arban. Although these methods are quite different in their approach, they all have an underlying message that has helped me to progress my playing way beyond my expectations and this same information will undoubtedly help you in your quest for trumpet mastery. Above that, I dedicate this method book to Maynard Ferguson, Bobby Shew, Roger Ingram, Allan Vizzutti, Wayne Bergeron, Charlie Davis, Arturo Sandoval, Chuck Findlay, Gary Grant and Lew Solloff, all of whom I have had the pleasure of meeting personally and talking trumpet with. I have also been lucky enough to have had lessons with or been to masterclasses and workshops by all of the above mentioned Superstars. The aim when writing these books was to compile and explain great information in the clearest, most concise way for players of all standards, then to combine basic to advanced exercises and to demonstrate them on CD. That is the real key to the success of this book – a step by step guide to help you understand, to hear and to copy! I am very proud to have received brilliant feedback from players from all over the world. It has certainly made the hundreds if not thousands of hours that I have put into practise and research over the years very worthwhile. Please enjoy the book and I am sure you will find plenty of information at this site to keep you motivated on your lifelong trumpet journey.